Cosmopolitan sensibilities acknowledging mutual obligations and human interconnectedness can orient people navigating the complexities of neighborhood and other forms of community-based archaeology. I suggest that practice aimed at engaging in ethical heritage work in neighborhoods can benefit from fostering cosmopolitan values among participants and stakeholders. I outline a model for “poly-communal archaeology,” an approach that takes a cosmopolitan stance and engages multiple stakeholders in neighborhood archaeology and heritage work. I then reflect on a case study of heritage work that employs such an approach in the neighborhood of “Old Deerfield” in western Massachusetts, U.S.A. In this case, a cosmopolitan sensibility is deployed to restructure the social relations that underpin heritage work. Defining what is valued as “heritage” is fraught with inequities of social and political power. Though often perceived as “experts” on the past, archaeologists are just one of many stakeholders with interests in how pasts are used in the present. Twenty-first century archaeologists face the challenge of engaging in discourses and actions with diverse individuals and communities about the meaning, value, and treatment of heritage sites and interpretation. As a result, archaeologists are increasingly working to reorient and restructure social relations by engaging multiple stakeholder groups in heritage work, especially those that have been previously left out of the process. This has resulted in the collaborative study of historical contexts and processes with diverse stakeholders engaging in heritage work rooted in particular places. Heritage, used here in the broad sense to mean that which is identified as valuable and significant about the past to meet the needs of contemporary people (Carman, 2005; Graham et al., 2000; Smith, 2006), is actively constructed and engaged in the present. As such, it comprises “work,” meaning activity, effort, and labor on the part of people (Smith, 2006: 13). Based on individual and collective values and social norms, people give some objects and places significance over others, elevating them to “heritage” and imbuing them with new meaning. The values and ethics of archaeologists and other practitioners in heritage disciplines (e.g., art history, architecture, history, museology) play a central role in this process. Archaeology, another kind of “work,” is a physical and social intervention that shapes, and is shaped by, heritage values. It is a tool for producing material heritage and provides a means of accessing media (e.g., objects, features, sites, landscapes) through which people remember, organize, think about, experience, and otherwise deploy the past. The important question here is how, and by whom, are determinations made regarding what is valued about the past (see collection of essays in de la Torre, 2005 and Mathers et al., 2005)? In other words, how is the work of heritage carried out, who participates, and what does it change in the present? In this essay, I suggest that cosmopolitan values - referring to a sense of interrelatedness with and responsibilities to others - can be used to orient participants navigating the complexities of “neighborhood” and other forms of community-based archaeology when multiple communities and stakeholders are involved. I decouple “community” from geography, and use “neighborhood” to refer to shared space and landscapes that root present day people. Communities form around shared interests, but they do not always share the spatial nearness that is a defining aspect of a neighborhood (as it refers to both people and places). While communities can transcend both space and time (for example, see Anderson, 1991: 9; Crooke, 2007; Smith and Waterton, 2009), neighborhoods attach people to places and localities. Neighborhoods are not bounded isolates, but rather multidimensional nodes in complex social networks. The concept of neighborhood paired with an archaeological perspective allows us to consider contemporary social, political, and economic configurations, while also considering such configurations through time. However, archaeology rooted in neighborhoods necessitates cosmopolitan values, especially in contexts where there are multiple communities with interests and stakes in heritage. I begin by outlining the cosmopolitan ideas that intersect with neighborhood archaeology as a form of community-based practice. Next, I offer a critique of three types of projects representing the status quo of global community-based archaeology and suggest that practice aimed at engaging in ethical heritage work in neighborhoods can benefit from incorporating and developing cosmopolitan values among participants and stakeholders. I sketch out a model for “poly-communal archaeology,” an approach that takes a cosmopolitan stance and engages multiple stakeholders in neighborhood archaeology and heritage work. I then reflect on a case study of heritage work that employs such an approach from the New England region of northeastern U.S.A. The neighborhood of “Old Deerfield” in western Massachusetts is a place where the colonial past is remembered daily by museum visitors, residents, and scholars, and heritage work has significant social and political impacts on Native peoples today, but only recently have Native Americans and other marginalized groups been actively engaged in the work of heritage. In this case a cosmopolitan sensibility is deployed to restructure the social relations that underpin heritage work. In the introduction to Cosmopolitan Archaeologies (Meskell, 2009a), Lynn Meskell (2009b) describes cosmopolitanism as a range of philosophical positions grounded in Western intellectual traditions. At its most basic, cosmopolitanism is a suite of sentiments and values that have to do with a sense of “…our obligations to others (or theirs to us)…” (Appiah, 2006: xv). Cosmopolitans share the core belief that we are all citizens of the world who have responsibilities to others. As applied to archaeology and heritage, cosmopolitan values extend our obligations to people across time and space (Meskell, 2009b: 1): “Doing cosmopolitan archaeology ought to mean that we take for granted that others matter” (González-Ruibal, 2009: 114). Meskell (2009b: 2) notes that cosmopolitanism may not provide a ready-made set of solutions for the problems facing archaeologists in the twenty-first century, but it does provide a way to view the multi-sited and multi-scalar engagements of which all participants in heritage work are a part. In contrast to the limitations and problems with cosmopolitanism at a global scale where “world heritage” is implied to be a universal “good” and common values are assumed (Meskell, 2009b: 5), notions of “rooted cosmopolitanism” are better suited to heritage work in neighborhood contexts. Rooted cosmopolitanism as sketched by Cohen (1992), Appiah (2006), and contributors to Meskell (2009a), among others, posits that cosmopolitans are “rooted in place,” but are networked and related to others at multiple scales and sites: “Rooted cosmopolitanism acknowledges attachments to place and the particular social networks, resources, and cultural experiences that inhabit that space” (Meskell, 2009b: 3-4). This rootedness has spatial, temporal, and historical dimensions that shape the matrix of social relations. It is the acknowledgement of and engagement with the multiplicity of connections and interconnections across space and time that make neighborhood and community-based contexts appropriate venues for fostering cosmopolitan values in heritage work. Cosmopolitanism encompasses the tensions between universal and local values, a tension common to community-based and neighborhood projects where the meaning and value of heritage is conceived of in ways that may conflict with those of neighbors, nations, or institutions. Despite the fact that community-based heritage work rooted in neighborhoods often encompasses the values of mutual responsibility and obligation among participants (including archaeologists), it also has the potential to reinforce or ignore structural inequalities and re-inscribe boundaries that prevent non-local or marginalized groups from participating in heritage work. In this vein, González-Ruibal (2009) finds flaw with a treatment of cosmopolitanism that ignores structural inequalities and assumes that all people have equal access to the resources and power necessary to participate in heritage work. He identifies two kinds of cosmopolitans: (1) powerful; and (2) disempowered, stating that “it is easy to be cosmopolitan when power is on one’s side” (González-Ruibal, 2009: 117). He argues for a cosmopolitanism that confronts the structural inequalities, long-term processes of oppression and trauma of Western colonialism and imperialism. González-Ruibal’s point is relevant to this discussion of neighborhood heritage projects because neighborhoods are multi-scalar, multidimensional, and constitute contexts where there may be substantial power differences, especially when they are considered as part of social networks that transcend time and space. For example, public historian David Glassberg (2001: 148-157) describes heritage work aimed at defining town character in an urban neighborhood in Springfield, Massachusetts, where there are African American, Latino, and Euroamerican resident constituencies with varying amounts of social, political, and economic power. Participants in heritage work from these ethnic communities related different conceptions of place and history in the McKnight district of Springfield, as did older and younger residents across these groups. Though a single neighborhood, there is no single community or interest group in this case, but rather multiple groups with varying amounts of power contributing to discourses and the work of valuing and mobilizing the past in the present. The number of recent publications dedicated to community-based archaeology and collaborative research attests to the range and global extent of archaeological projects that involve working directly with communities and relinquishing at least partial control of a project to those communities. This includes community-based archaeological research in North America (for example, see Colwell-Chanthaphonh and Ferguson, 2008; Derry and Malloy, 2003; Kerber, 2006; Little and Shackel, 2007; Million, 2005; Nicholas and Andrews, 1997; Shackel and Chambers, 2004; Silliman, 2008; Swidler et al., 1997) and globally (for example, see Delle, 2003; Green et al., 2003; Greer et al., 2002; Merriman, 2004; Meskell, 2009a; Moser et al., 2002; Paz, 2010; Raharijaona, 1989; Sen, 2002; Smith, 2006; Smith and Waterton, 2009; Thorley, 2002; collection in World Archaeology 34). Many of these community-based and neighborhood projects, like others, acknowledge and shape action around cosmopolitan values like obligations and responsibilities to others. There is no doubt that, as Marshall (2002: 218) concludes, such practice encourages archaeologists to address questions they otherwise would not, to see archaeological remains in a new light, and to think in new ways about how the past informs the present. Nonetheless, there are significant structural problems with many community-based projects that limit their efficacy in addressing the inequities of social and political power of defining what is valued as heritage. Here, I characterize the limitations of three approaches to heritage projects: (1) the Single Stakeholder Mode; (2) the Top-Down Mode; and (3) the Marginalizing Multivocal Mode. For each, I sketch their limitations and reflect on how a cosmopolitan stance can be employed to reorient such approaches. The Single Stakeholder Mode. While forms of community-based approaches like neighborhood archaeology are becoming more common, they are sometimes structured as a one-to-one working relationship and partnership, meaning one archaeologist, or group of archaeologists, and one community. Yet in many cases there are multiple stakeholder groups with interests in heritage work (Singleton and Orser, 2003). Too often, archaeologists only see descendant communities or local residents as possible stakeholders. While the acknowledgement of these groups as stakeholders is ethically sound, limiting engagement to a single group or assuming that such groups are homogenous can be problematic and put long-term heritage work and stewardship plans in jeopardy, particularly in cases where archaeological sites are on private land and/or in areas with no resident descendant community. A cosmopolitan approach that recognizes the interconnectedness of past and present social networks reorients such work and demands engagement with multiple stakeholders - local and diasporic - to define goals and take action for archaeological investigation, interpretation, stewardship, and preservation. Projects that focus on a single stakeholder community (descendant or otherwise) risk encountering problems and roadblocks from other unacknowledged or unengaged groups which may undermine broader project goals in the realm of social justice and social change. Heritage work that invites all potential stakeholders to participate in heritage communities and to engage in discourses about multiple pasts - dominant and dissonant heritage narratives - has the potential to harness the knowledge, power, and resources that these stakeholders can contribute. The Top-Down Mode. Many projects employ a “corporate” or top-down organizational framework where the archaeologist is the convener and decision-maker who mediates among stakeholders throughout the project. Rather than redistributing power among stakeholder participants, and shifting power from the archaeologist to the community of stakeholders, top-down projects maintain a hierarchy where the archaeologist’s power and position of prestige is protected and re-affirmed through the project’s organizational framework. In this model, stakeholders do not have the opportunity (nor incentive) to “see” each other’s interests, making it difficult and unlikely for compromise to occur, and making it difficult to challenge the invisibility of some stakeholders (especially those with little social, political, or economic power) in the present. In contrast, a cosmopolitan stance acknowledging mutual obligations and responsibilities of all participants brings their different interests into focus, recognizing the value of different perspectives and an overt concern for the inequities of power that emerge in conflict situations. Is it enough for Indigenous people to have a seat at the multivocal table if all voices are considered equally valid and there is no concern for evaluating which interpretations are the strongest, supported by evidence, and appropriately fit the data? If we rely on multivocality to mean that all voices are equally valid, then doesn’t multivocality, in some ways, constitute a loss of power for Indigenous (and other “marginal”) groups, who no longer have any claim to truth or greater legitimacy? She asks whether democratizing heritage discourses by treating the truth claims of all participants as equally valid is harmful to already marginalized groups. Multivocal approaches can do significant harm to stakeholders, marginalizing already disenfranchised voices by claiming that their truth claims are “equal” with those put forth by dominant voices. Multivocal models can, contrary to their intent, reaffirm and re-inscribe dominant power structures. However, heritage work can also actively engage stakeholders in the collective process of evaluating multiple truth claims and assessing validity, demonstrating to participants that there are different ways of knowing and mobilizing the past in the present. A cosmopolitan stance replaces the inclusive, multicultural, or multivocal models where “everyone has a voice” - de-privileging forms of difference and disempowering already marginalized peoples - with concern for historical inequalities and exploitation (Hodder, 2009: 191). The essential limitation of community-based projects that fall into the categories outlined above is that power relations and their associated inequalities - how they are organized and structured, how power is distributed, and how and by whom it is deployed - are neither problematized nor negotiated. As Atalay (2008: 38) notes, “the replacement of one power structure with another without changing the way power is perceived and enacted is pointless.” Engaging with communities, challenging dominant narratives, promoting social justice, and decolonizing archaeology are fundamentally about deconstructing and creating alternatives to dominant power structures. To affect these broader goals, power must be negotiated and constantly re-negotiated. Cosmopolitanism offers a suite of values that can be actively promoted and cultivated in neighborhood contexts and an orientation that can guide collaborative projects. To avoid the limitations of the Single Stakeholder Mode, the Top-Down Mode, and the Marginalizing Multivocal Mode, I have proposed an approach to heritage work rooted in neighborhoods that engages multiple communities, which I refer to as “poly-communal archaeology” (Hart, 2009). What I mean is an archaeology that engages multiple stakeholders who have different levels of interest, commitment, and resources to contribute to the project throughout the entire research process. A central component of this approach is acknowledging that while the heritage work is rooted in place, the connections of people to the locality and to each other are not static, but rather fluid, shifting, and changing over time (even over the course of a project). Individuals may live in or away from a neighborhood, and may be members of multiple communities. Sensitivity to these “nested identities” and how they impact relationships and inform decisions is crucial (Tuhiwai Smith, 1999: 126). For instance, an avocational archaeologist may also be a neighborhood resident and property owner and member of a town planning board, making her a member of multiple stakeholder communities with varying interests in archaeological projects. Similarly, a member of a descendant community may represent multiple descendant communities and may have social, political, and economic ties to archaeologists and institutions. Poly-communal archaeology is inherently public archaeology, but instead of aiming to serve a broadly defined (or undefined), unembodied “public” audience, it acknowledges the fragmented and shifting nature of communities and seeks to engage archaeology as heritage work that connects people - local and dispersed - across time and space. In effect, poly-communal archaeology is about building a community of stakeholders - a heritage community - by engaging multiple stakeholders in heritage work rooted in place. This is crucial in places where there are many stakeholders with varying interests and claims to the past and different amounts of social and political power in the present, as is the case in North America, and particularly in the New England region of the U.S.A. Poly-communal projects shape and are shaped by particular social, political, and historical contexts and require constant cross-cultural engagement and dialogue. Building trust relationships with and among stakeholders is one the most important aspects of poly-communal approaches. Cosmopolitan sensibilities provide a sound orientation for these efforts. In much of the New England region of the U.S.A., especially areas characterized by a landscape of mixed rural, suburban, and industrial uses, “neighborhoods” are subsumed within “towns.” The “town” is an entity widely accepted as quintessentially “New England” with mythologized origins in the colonial period (Glassberg, 2001: 133-135). In this context, the “neighborhood” may constitute a “community,” though as previously established, they are not necessarily analogous. 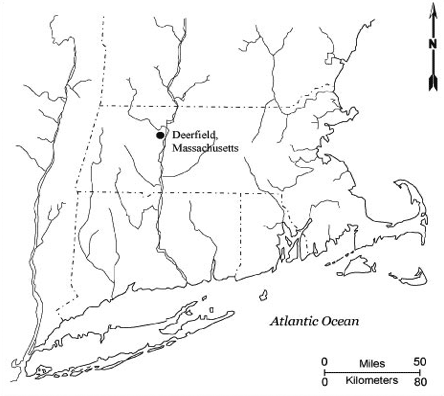 Deerfield, Massachusetts, is located at the confluence of the Deerfield and Connecticut Rivers in western New England and covers approximately 33.4 square miles (Figure 1). The neighborhood of Old Deerfield, a National Historic Landmark known as Old Deerfield Historic District, is centered on a mile-long street beside the Deerfield River. The area was originally settled by Native peoples at least 13,000 years ago and has a very rich and complex pre-contact Native history as demonstrated by the rich archaeological record (Chilton, 2009a; Chilton and Paynter, 2009; Chilton et al., 2005). Today, it is a town of just under 5,000 residents; many are the descendants of an influx of eastern European immigrants in the nineteenth and twentieth centuries. Over 97% of town residents identified as “white” in the 2000 U.S. Census, and less than 1% of census respondents identified as African American, Native American, Asian, “other,” or from two or more racial groups. The town has a rural character, with a mix of agricultural and conservation lands and commercial and industrial properties. It is also home to a number of cultural and educational institutions - three private schools and two museum institutions - concentrated in the neighborhood of Old Deerfield. These institutions support and promote two of Deerfield’s main industries: education and heritage tourism. Fig. 1: Map of Southern New England showing location of Deerfield, Massachusetts. 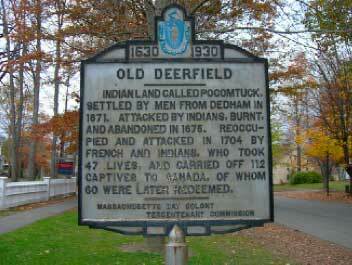 For much of the seventeenth and eighteenth centuries, Deerfield was both a “frontier” town for European colonizers, immigrants, and their descendants, and a place within a Native American homeland. As such it was a place of complex intercultural relationships, ranging from violent encounters to everyday interactions. In the late nineteenth and early twentieth centuries, a heritage discourse emerged in Deerfield as residents sought to attract the wealthy descendants of the town’s English settlers to purchase the village’s old homesteads by playing up the values and lifestyle of colonial New England’s agricultural village life (Chilton and Paynter, 2009; Glassberg, 2001: 137). This was part of a broader trend across New England where “…local promoters put their dilapidated buildings and grass-grown streets to work, creating ‘old Deerfield’ or ‘romantic Marblehead’…transforming the economic hardship and dislocations of those places into a powerful marketing device” (Brown, 1995: 9). Subsequent heritage work was undertaken in the 1920s by the headmaster of Deerfield Academy, an elite private boarding school in the center of the village, who purchased properties along the village’s central street and refurbished them as dormitories in a colonial style to attract wealthy families to his school (Glassberg, 2001: 137; Paynter, 2002: S87). Beginning in the late 1930s, the parents of a Deerfield Academy student, Henry and Helen Geier Flynt, were so captured by the colonial feel of the town that they purchased and restored several remaining homes and established a foundation in 1952 which later became Historic Deerfield, Inc., one of two major heritage institutions in the town (Glassberg, 2001: 137; Historic Deerfield, 2008; Paynter, 2002: S87). Fig. 2: Tercentenary marker outside of the Dwight House, Old Deerfield. It is a story that celebrates colonial English Protestant settlement, acknowledges a land called “Pocumtuck” (but not people), and positions Native peoples as “other,” “attacker,” “pre-English,” or “disappeared.” Unlike the memory of English Protestant colonial life in Deerfield, which has a place in regional and national historical memory, the Pocumtuck, their places, and their descendants are mostly forgotten in and beyond Deerfield. In Deerfield, the material consequences of the past and of heritage tourism in the present are part of everyday life. The neighborhood is a heritage-scape. But in addition to being a place that people visit to experience heritage, Deerfield is a place where people live with and negotiate how the past is mobilized and presented in their midst. It is a neighborhood to which a variety of local and non-local contemporary communities have social ties and a place where what is valued as heritage has been directed largely by institutions and a privileged few. Since 2006, I have been part of collaborative heritage work focused on a seventeenth-century Native American site in Old Deerfield. The site is believed to be the location of a fortified place of the Pocumtuck people known as the Pocumtuck Fort, which was purportedly attacked by Mohawk raiders in 1665/6. The project developed from the recognition of overlapping interests among three stakeholder groups - diasporic Native American descendants, local avocational archaeologists, and professional archaeologists and historians - discerned from a dialogue among members of these groups beginning in 2005 (see Hart, 2009: 97-125 for discussion of project inception and development). Employing a poly-communal approach, colleagues from University of Massachusetts Amherst and I are working with a community of stakeholders that includes representatives of diasporic Native American descendent communities, avocational archaeologists, landowner (an educational institution), field school students, and Historic Deerfield, Inc. Our work is aimed at documenting the site and developing a long-term conservation plan while grappling with different heritage values in inter- and intra-cultural contexts (Chilton, 2009b). We sought to bridge the geographic distances among descendant communities and ancestral homelands (largely the result of colonial displacements) and to reshape the contemporary social relations that underpin heritage work in Deerfield by bringing non-local stakeholders back to the neighborhood to work collaboratively with local stakeholders (see Hart, 2009: 126-152). Before this project, many of these groups (e.g., Native American groups, avocational archaeologists) had been largely left out of the institutionally directed heritage work in Deerfield and had not worked together on such issues. The project has involved developing a specific set of methodologies for heritage community building because it hinges on voluntary collaborations taking place outside of legislated relationships that have a set of required interactions and standard practices. Much of the work thus far has taken place in the teaching and mentoring context of an archaeological field school with a central focus on promoting heritage values (see Chilton, 2009b). The details and methods of this project, which included workshops to develop research questions and testing strategies, on-site peer review, and consensus-building can be found in Hart (2009) and Chilton and Hart (2009). Though the impetus for this heritage work was to “find out what happened” at the site - something all participants expressed interest in at the start, but for different reasons - the collaborative work so far has done more than simply fill in gaps in what is known about the Native past. The material dimension of heritage work - transects, test pits, brass points, glass beads, pottery sherds, pit features - have created and constituted a new space for cosmopolitan, intercultural discourses about the past in the present. The materials bring forth discomfort and rupture in the collective memories that are perpetuated in Deerfield, not because they are direct evidence of violence (associated with raiders, attackers, victims, etc. ), but because they are mundane and speak to survival. When encountered in a collaborative context, objects of everyday life provide a physical reminder of the humanity and survival of Native peoples in the Northeastern U.S. and draw attention to the social divisions that have been papered over by dominant heritage discourses. The heritage work engaged by Native and non-Native stakeholders focusing on historical erasures, overt violence, and the everyday legacies of discrimination, racism, and inequalities refers to and flow from these objects. Reflection on practical experiences and analysis of the discourses among the heritage community that have emerged from this project reveals the importance of cosmopolitan orientations in neighborhood heritage projects. When cosmopolitan values like mutual obligation, reciprocity, and interconnectedness guide discourse and action, intersecting interests become clear and negotiation is possible. This collective work involves destabilizing assumed universals like the rights of landowners and private property, as well as institutional and expert privilege in defining what is valued and significant as heritage. For example, when it came time to formally “ask permission” to do fieldwork (after plans had been developed with project participants), it was important to acknowledge the responsibility to request permission first from the representatives of Pocumtuck descendants, as well as the contemporary landowner and the State Historic Preservation Office as required by law (see discussion in Chilton and Hart, 2009; Hart, 2009: 128-129). We explained to stakeholders that our excavation was contingent on the permission of the Native American representatives. This was an important part of efforts to demonstrate the contemporary relationship between dispersed Native communities and ancestral homelands to all of the stakeholders. Recognizing the rights of descendant communities to allow or refuse the project redistributed power in this context, and shifted the traditional power structure which privileges government organizations and private property owners (Hart, 2009: 128-129). Working with this heritage community has also revealed that compromising cosmopolitan sensibilities can re-inscribe existing social, political, and economic power differences. When one or more stakeholders act in their own interests or assert rights or privileges others do not possess, the potential for negotiation is greatly diminished. Though conflicts are likely to develop in multi-stakeholder projects, the cosmopolitan values that shape such projects offer a way of resolving frictions. For example, we encountered disagreement among stakeholders regarding research questions and field methods (see Hart, 2009: 156-157). Some archaeologists, both professional and avocational, were interested in the contents of the features at the site and they advocated sampling a greater number of features. Others advocated a conservative approach to feature excavation. Though this situation caused tensions and debate, the poly-communal approach provided a mechanism for conflict resolution. A range of possible options were presented by project archaeologists to address the collectively developed research questions and discussed by stakeholders. Though field methods were negotiated with all stakeholders, the power to decide which approach to take lay with the heritage community and was resolved through a discursive process aimed at consensus, rather than being the decision of one archaeologist or another asserting their expert privilege. For the most part, instances like this resulted in productive dialogue about archaeological ethics, practice, and conservation, but conflict should be expected, even when goals are agreed upon and cosmopolitan values are shared. One of the greatest lessons I have learned from participating in the multi-stakeholder heritage work rooted in the neighborhood of Old Deerfield is that “being a good neighbor” is not only important at the local level. Neighborliness - our obligations to others - transcends Western notions of bounded private property, ownership of places and things, and expert domains to include social networks that span time and space. A cosmopolitan sensibility reminds us that people, sites, and heritage are interconnected, and our actions have consequences beyond our neighborhoods. Bridging the distances and inequalities that have resulted from colonization and decoupling “community” from geography means that our neighborly responsibilities expand beyond those we share physical space with. Community-based approaches are about engaging the tensions between past, present, and future and initiating social change. They seek to make heritage work a transformative process for participants. In these projects, archaeologists can use their social and political power to insist on the inclusion of disempowered people, like many Indigenous communities, in planning and implementing archaeological projects, interpretation, and preservation and stewardship efforts (McDavid, 2003: 51). But as Native scholar Taiaiake Alfred (1999: xxiv) argues, “if we are to effect real change...non-indigenous people must come to share the objective of justice.” Poly-communal projects, like the case study presented here, can foster transformations in the direction of social justice by highlighting relationships among dispersed descendant communities and ancestral homelands and including multiple stakeholders to ensure the long-term viability and relevance of heritage work. By working collectively with those who have historically been invested with significant power when it comes to defining heritage values (e.g., heritage institutions, state bureaucracies, landowners) along with those who have been historically disempowered (e.g., descendant communities) or overlooked (e.g., avocational archaeologists, local residents) in these realms, we can negotiate a power structure that is more equitable and just. I thank Robert Austin and Uzi Baram and the participants in the 2010 SAA session “Neighborhood Archaeology” for challenging me to think about the intersections of neighborhoods, communities, and heritage. I have been encouraged to think about power and the politics of heritage in Deerfield by all who have contributed to the Pocumtuck Fort Archaeology and Stewardship Project, especially Elizabeth Chilton, Angela Labrador, Katharine Kirakosian, and the staff and students of the UMass Amherst Field School in Archaeology 2004-2008; Troy Phillips, Jim Peters, and the members of the Massachusetts Commission on Indian Affairs; Andrew Chase, Marge Bruchac, Claire Carlson, Bud Driver, Robert Paynter, Peter Thomas, and Philip Zea. This paper (and a significantly rougher draft) benefited from the insightful comments of Robert Austin, Uzi Baram, Elizabeth Chilton, Amy Groleau, and an anonymous reviewer. Alfred, G T 1999 Peace, Power, and Righteousness: An Indigenous Manifesto. Don Mills, Ontario: Oxford University Press. Anderson, B 1991 Imagined Communities: Reflection on the Origins and Spread of Nationalism. London: Verso. Appiah, K A 2006. Cosmopolitanism: Ethics in a World of Strangers. New York: W.W. Norton. Atalay, S 2008 Multivocal and Indigenous Archaeologies. In Evaluating Multiple Narratives: Beyond Nationalist, Colonialist, and Imperialist Archaeologies, edited by J. Habu, C. Fawcett and J.M. Matsunaga, pp. 29-44. New York: Springer. Brown, D 1995 Inventing New England. Washington, DC: Smithsonian Institution Press. Carman, J 2005 Good Citizens and Sound Economics: The Trajectory of Archaeology in Britain from “Heritage” to “Resource.” In Heritage of Value, Archaeology of Renown: Reshaping Archaeological Assessment and Significance, edited by C. Mather, T. Darvill, and B.J. Little, pp. 43-57. Gainesville, FL: University Press of Florida. Chilton, E S 2009a Native History and the Archaeology of the Pocumtuck Homeland. Historic Deerfield Magazine 10(1): 12-15. Chilton, E S 2009b Teaching Heritage Values through Field Schools: Cases Studies from New England. In Heritage Values: The Past in Contemporary Society, edited by H. Soderland, G. Smith, and P. Messenger, pp. 147-158. Walnut Creek, CA: Left Coast Press. Chilton, E S and S M Hart 2009 Crafting Collaborative Archaeologies: Two Case Studies from New England. Collaborative Anthropologies 2: 87-107, doi:10.1353/cla.0.0016. Chilton, E S and R Paynter 2009 Deerfield Village and Nearby Sites, Connecticut River Valley, Massachusetts: Ancient and Historic Archaeology in the Connecticut River Valley. In Archaeology in America: An Encyclopedia, edited by F. McManamon, L. Cordell, K. Lightfoot, and G. Milner, pp. 118-122. Westport: Greenwood Publishing. Chilton, E S, T Ulrich and N Rinehart 2005 A Reexamination of the DEDIC Paleo-Indian Site, Deerfield, Massachusetts. Massachusetts Archaeological Society Bulletin, 66(2): 58-66. Cohen, M 1992 Rooted Cosmopolitanism. Dissent (Fall): 478-483. Colwell-Chanthaphonh, C and T J Ferguson (eds.) 2008 Collaboration in Archaeological Practice: Engaging Descendant Communities. Lanham: AltaMira Press. Crooke, E 2007 Museums and Community: Ideas, Issues and Challenges. London: Routledge. de la Torre, M (ed.) 2005 Heritage Values in Site Management: Four Case Studies. Los Angeles: The Getty Conservation Institute. Delle, J 2003 On Collaboration, Class Conflict, and Archaeology in Brazil. International Journal of Historical Archaeology 7(3): 223-237, doi:10.1023/A:1027410800779. Demos, J 1994 The Unredeemed Captive: A Family Story from Early America. New York: Vintage Books. Derry, L and M Malloy (eds.) 2003 Archaeologists and Local Communities: Partners in Exploring the Past. Washington, D.C.: Society for American Archaeology. Glassberg, D 2001 Sense of History: The Place of the Past in American Life. Amherst: University of Massachusetts Press. González-Ruibal, A 2009 Vernacular Cosmopolitanism: An Archaeological Critique of Universalistic Reasoning. In Cosmopolitan Archaeologies, edited by L. Meskell, pp. 113-139. Durham, NC: Duke University Press. Graham, B, G J Ashworth and J E Tunbridge 2000 A Geography of Heritage: Power, Culture & Economy. London: Arnold Publishers. Green, L F, D R Green and E G Neves 2003 Indigenous Knowledge and Archaeological Science: The Challenges of Public Archaeology in the Reserva Uaca. Journal of Social Archaeology 3(3): 366-398, doi:10.1177/14696053030033005. Greer, S, R Harrison and S McIntyre-Tamwoy 2002 Community-Based Archaeology in Australia. World Archaeology 34(2): 265-287, http://www.jstor.org/stable/827912. Haefeli, E and K Sweeny 2003 Captors and Captives: The 1704 French and Indian Raid on Deerfield. Amherst: University of Massachusetts Press. Hart, S M 2009 High Stakes: A Poly-Communal Archaeology of the Pocumtuck Fort, Deerfield, Massachusetts. Ph.D. dissertation, Department of Anthropology, University of Massachusetts Amherst. Historic Deerfield, Inc. 2008 Historic Deerfield: About Us. Electronic document, http://www.historic-deerfield.org/about-us, accessed June 9, 2010. Hodder, I 2009 Mavili’s Voice. In Cosmopolitan Archaeologies, edited by L. Meskell, pp. 184-204. Durham, NC: Duke University Press. Kerber, J (ed.) 2006 Cross-Cultural Collaboration: Native Peoples and Archaeology in the Northeastern United States. Lincoln, NE: University of Nebraska Press. Little, B J and P A Shackel (eds.) 2007. Archaeology as a Tool of Civic Engagement. Walnut Creek, CA: AltaMira Press. Malloy, M 2003 Introduction. In Archaeologists and Local Communities: Partners in Exploring the Past, edited by L. Derry and M. Malloy, pp. ix-xiii. Washington, D.C.: Society for American Archaeology. Marshall, Y 2002 What is Community Archaeology? World Archaeology 34(2): 211-219, doi:10.1080/0043824022000007062. Mathers, C, T Darvill and B J Little (eds.) 2005. Heritage of Value, Archaeology of Renown: Reshaping Archaeological Assessment and Significance. Gainesville, FL: University Press of Florida. Merriman, N (ed.) 2004 Public Archaeology. London: Routledge. Meskell, L (ed.) 2009a Cosmopolitan Archaeologies. Durham, NC: Duke University Press. Meskell, L 2009b Introduction: Cosmopolitan Heritage Ethics. In Cosmopolitan Archaeologies, edited by L. Meskell, pp. 1-27. Durham, NC: Duke University Press. McDavid, C 2003 Collaboration, Power and the Internet: The Public Archaeology of the Levi Jordan Plantation. In Archaeologists and Local Communities: Partners in Exploring the Past, edited by L. Derry and M. Malloy, pp. 45-66. Washington, D.C.: Society for American Archaeology. Melvoin, R 1989 New England Outpost: War and Society in Colonial Deerfield. New York: W.W. Norton. Million, T 2005 Developing an Aboriginal Archaeology: Receiving Gifts from the White Buffalo Calf Woman. In Indigenous Archaeologies: Decolonizing Theory and Practice, edited by C. Smith and H.M. Wobst, pp. 43-55. London: Routledge. Moser, S, D Glazier, J E Phillips, L el Nemr, M S Mousa, R N Aiesh, S Richardson, A Conner and M Seymour 2002 Transforming Archaeology through Practice: Strategies for Collaborative Archaeology and the Community Archaeology Project at Quseir, Egypt. World Archaeology 34(2): 220-248. Nicholas, G P and T D Andrews (eds.) 1997 At a Crossroads: Archaeology and First Peoples in Canada. Burnaby, B.C. : Archaeology Press. Paynter, R 2002 Time in the Valley: Narratives about Rural New England. Current Anthropology 43(supplement): S85-S101, http://www.jstor.org/stable/3596513. Paz, Y 2010 Community Archaeology in Proto-Historical Tel Bareqet, Israel: School Children and Agency for Active Public Engagement in Cultural Heritage Projects. Public Archaeology 9(1): 34-47, doi:10.1179/175355310X12657988535542. Pocumtuck Valley Memorial Association/Memorial Hall Museum (PVMA) 2004 Raid on Deerfield: The Many Stories of 1704. Electronic document, http://www.1704.deerfield.history.museum, accessed June 9, 2010. Potter, P B 1994 Public Archaeology in Annapolis: A Critical Approach to History in Maryland’s Ancient City. Washington, D.C.: Smithsonian Institution Press. Raharijaona, V 1989 Archaeology and Oral Traditions in the Nitongoa-Andrainjato Area (Betsileo Region of Madagascar). In Who Needs the Past: Indigenous Values and Archaeology, edited by R. Layton, pp.189-194. London: Unwin Hyman. Sen, S 2002 Community Boundary, Secularized Religion and Imagined Past in Bangladesh: Archaeology and Historiography of Unequal Encounter. World Archaeology 34(2): 346-362, http://www.jstor.org/stable/827917. Shackel, P A and E J Chambers (eds.) 2004 Places in Mind: Public Archaeology as Applied Anthropology. New York: Routledge. Silliman, S W (ed.) 2008 Collaborating at the Trowel’s Edge: Teaching and Learning in Indigenous Archaeology. Tucson: The University of Arizona Press. Singleton, T and C Orser 2003 Descendant Communities: Linking People in the Present to the Past. In Ethical Issues in Archaeology, edited by L.J. Zimmerman, K.D. Vitelli, and J. Hollowell-Zimmer, pp. 143-152. Walnut Creek, CA: AltaMira Press. Smith, L 1994 Heritage Management as Postprocessual Archaeology? Antiquity 68(259): 300-309. Smith, L 2006 Uses of Heritage. London: Routledge. Smith, L and E Waterton 2009 Heritage, Communities and Archaeology. London: Duckworth. Swidler, N, K E Dongoske, R Anyon and A S Downer (eds.) 1997 Native Americans and Archaeologists: Stepping Stones to Common Ground. Walnut Creek, CA: AltaMira Press. Thorley, P 2002 Current Realities, Idealised Pasts: Archaeology, Values and Indigenous Heritage Management in Central Australia. Oceania 73(2): 110-125, http://www.jstor.org/stable/40331883. Tuhiwai Smith, L 1999 Decolonizing Methodologies: Research and Indigenous Peoples. London: Zed Books. Zimmerman, L 2006 Consulting Stakeholders. In Archaeology and Practice, edited by J. Balme and A. Paterson, pp. 39-58. Malden: Blackwell.